Warderick Wells trail to BooBoo Hill lookout point. “Be off the boat for three hours,” Wayne requested. He was tackling a nasty job, tracing leaks to our bilge pump. When Wayne knows his work likely entails swearing like a sailor he figures its best to minimize collateral damage. Wise man. 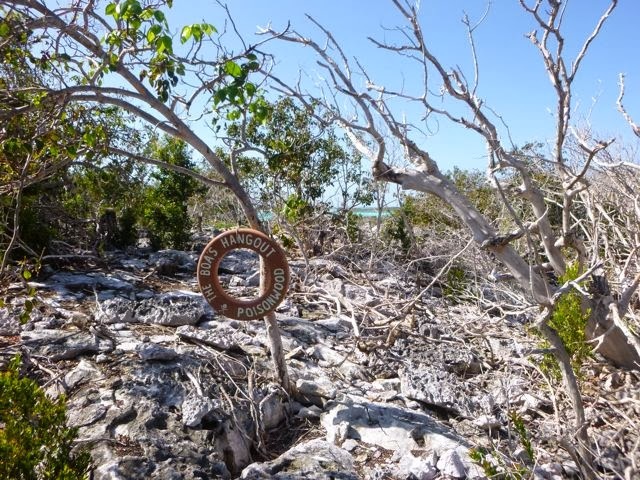 Warderick Wells Cay is chock full of hiking trails (click here to access map – wish I had!). This was a perfect opportunity to explore them, particularly as left to my own devices, I set a far faster pace than walking with Wayne. He says, “I stroll; you do a Bataan death march.” Besides, solo snorkeling in the strong cool current with sharks and rays struck me as unwise. It was about 11:30 by the time I tied our dinghy off at the park office to head off for my hike. I meant to pick up a trail map, but didn’t, though found out afterward they didn’t have one to spare, had I asked. I also thought I brought my handheld GPS, “just in case,” and didn’t. 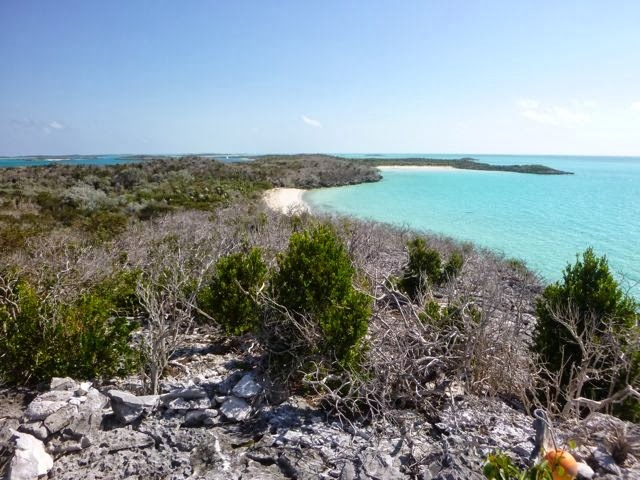 Pirates Lair sounded interesting; it was at the cay’s Southern tip on the Exuma Sound side; we were anchored near the cay’s Northern tip. Warderick Wells Causeway trail to Butterfly Beach. The initial trails, Causeway, Butterfly Beach, Hutia and Shady Tree were simple and welcoming enough. There were some fun, unmapped surprises, like Lucky Spot Beach, Boas Poisonwood Hangout and Murphy’s Hideaway. 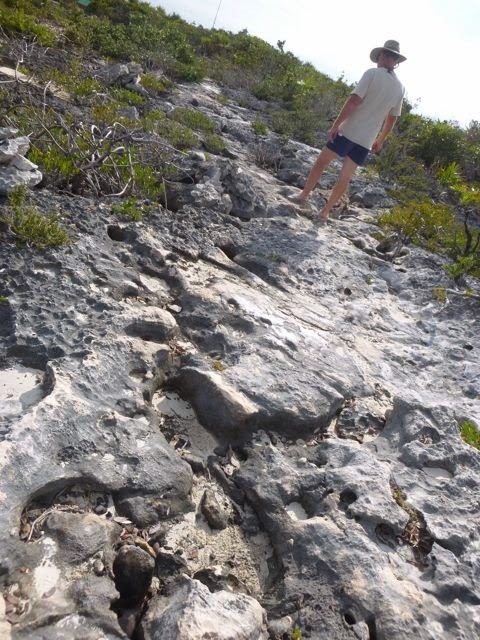 But as I wended my way to the Exuma Sound side, where trails became harder to follow ridge walks, the going kept going… and going… and going. Pirates Lair still looked like quite a ways away, according to the occasional “You are here” map postings. 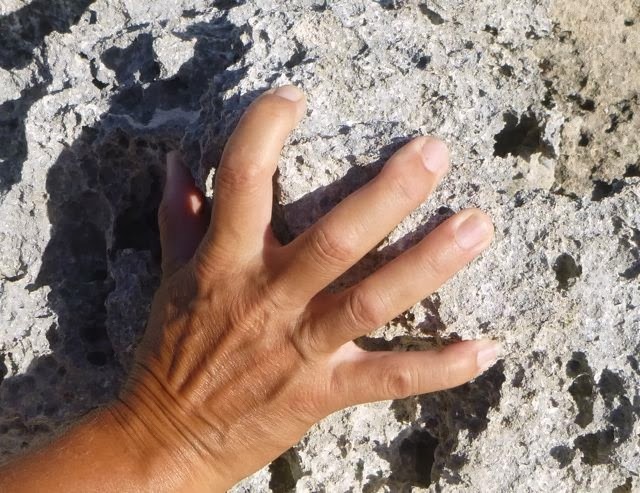 That prompted me to opt instead for “The Wall”, which traversed back to the other side of the island, where it looked like I could hop from beach to beach with greater ease. The Wall deposited me at Berry Beach, which rather than a cakewalk to the next beach, my choices were to double back, swim a long ways through some strong current areas, risking that my drybag was truly a drybag, tear my way through dense brambles, or rockclimb, crabbing my way horizontally across the porous, spiky rocks that comprised the shoreline between the beaches back. 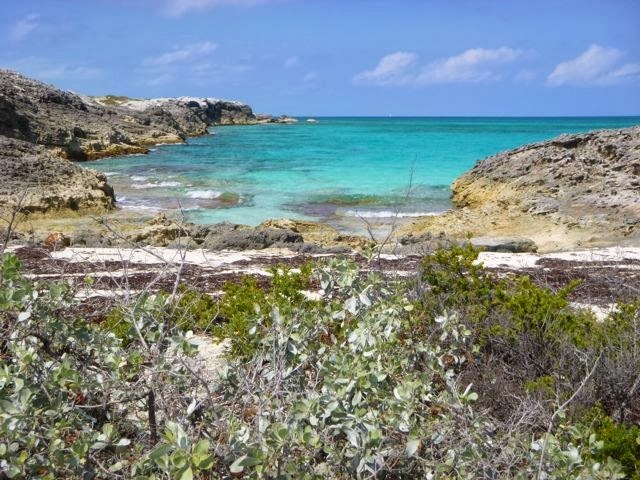 Exuma Sound as seen from Warderick Wells East side beach. Grimly reminding myself, “I do not have health insurance*,” I did my best to balance what struck me as the fastest verus a safe enough way back. It was half an hour before I was due back at the boat, and two and a half hours since I’d left. It was looking unlikely any choice would get me back in time except maybe swimming. I opted for crabbing, figuring eventually I’d intersect with a trail. Then I tried the brambles, but there was enough poisonwood I retreated to crabbing. Besides, it struck me I’d be more visible from the shoreline if I needed to flag someone for help, though I saw no only one fishing boat too early to swallow my pride and flag them. 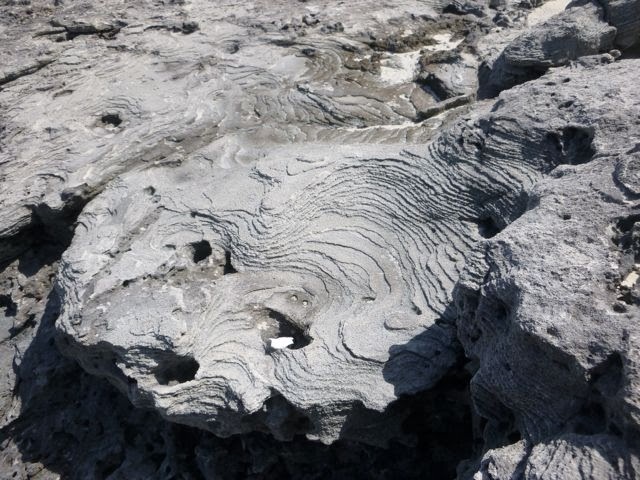 Sea sculpted limestone on Warderick Wells Exuma Sound side. Eventually, arriving at Rendezvous Beach put me back on track to predictable trails. Definitely bit off more than I could chew that day, though, turns out, Wayne was just finished when I returned after four hours. He hadn’t had the opportunity to worry. The next day, Wayne and I dinghied past Emerald Rock, and I pointed out Berry and Rendezvous Beach and the nasty rocks I clambered across to get there. We beached our dinghy on Tabeuia beach. We strolled. Life was good. Clearly, this was the smart strategy for easy access. Berry Beach to get to Rendezvous Beach. “They call it the iron shore,” said Pierce Ostrander of s/v Wabi Sabi, when I told him about my hapless hike. “Is it because the rock has iron?” I asked. “No, because they’re like a fortress, making access difficult.” Ummm, yeah. I’ll buy that one. I never did make it to Pirates Lair. If I do, it will be by boat, unless I get a much earlier start and go with another avid hiker. Close up of rock similar to what I crabbed along at Warderick Wells. March 4, 2014. 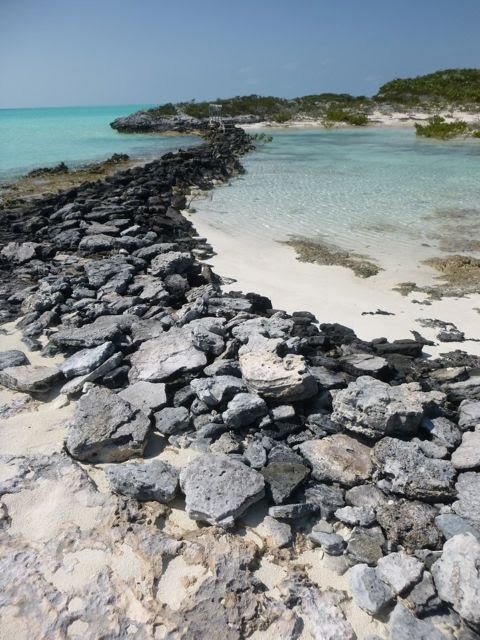 We're anchored off Georgetown, BAHAMAS Monument Beach, not too far from N23.32.5 W75.46.8. This post reflected when we were at Warderick Wells, Exuma Land and Sea Park, about two weeks ago. *Technically, this is no longer true. Wayne and I as relatively destitute Washington State residents applied for, were accepted by and are now in theory covered by WA State’s Affordable Care act. But since we’ve yet to check in with an approved State practitioner, our coverage is not yet clearly available. We even have Diver’s Assist Network insurance which would cover a flight to emergency medical care, if required. which causes wicked allergic reactions upon contact. 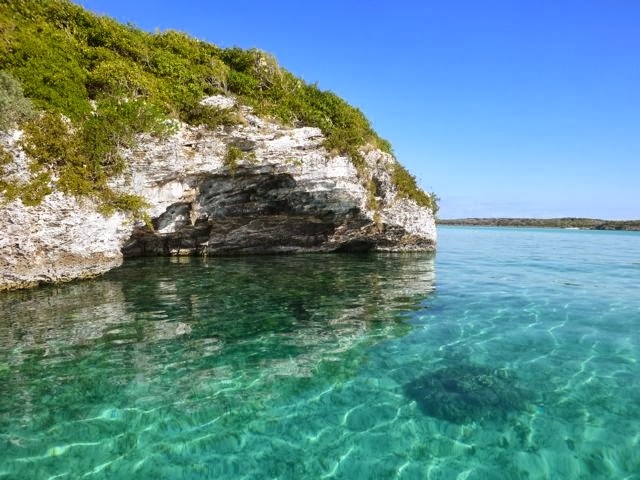 Emerald Rock near Warderick Wells Exumas. 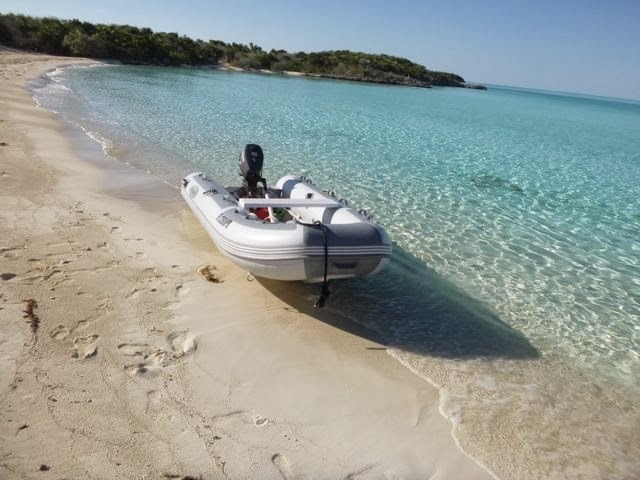 The smart way to visit Tabeuia Beach, Warderick Wells – via dinghy. Thanks, Ken. Where are you now? It sounds like Wayne and I have the same tool box of verbal tools. It's amazing how tossing a few of those at the problem makes it happen. Funny! BTW where are you cruising now Dave?